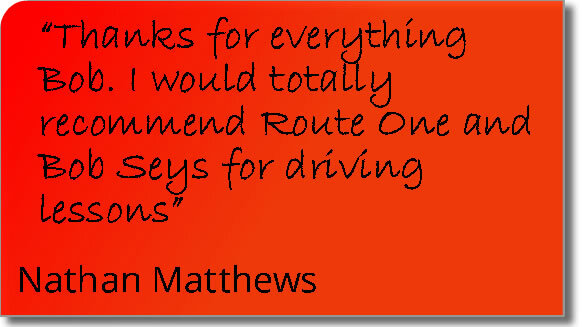 We offer a very flexible range of driving lessons in the Thetford, Bury St Edmunds and Brandon areas. Lesson times can vary to suit your needs and availability - we offer 1 hour, 1.5 hour, 2 hour and semi-intensive courses. Early morning, evening and weekend lessons are available. 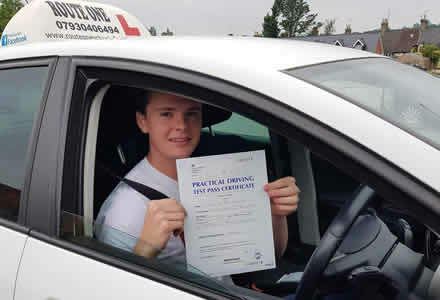 Driving lessons can be tailored to complete beginners or refreshers requiring motorway driving skills. Pass Plus, Motorway training, Taxi Test Preparation and Trailer Training (B+E) lessons are offered. A range of discounts are offered to reduce costs. 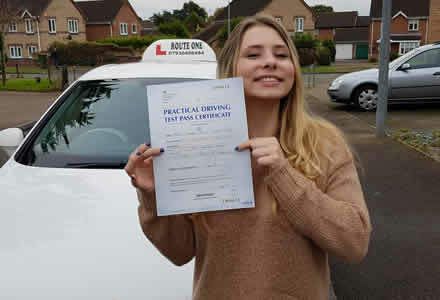 Practice driving on the types of roads in and around Bury St Edmunds that you will face during your driving test - we take our students into Bury St Edmunds as this is where the majority will take their test. 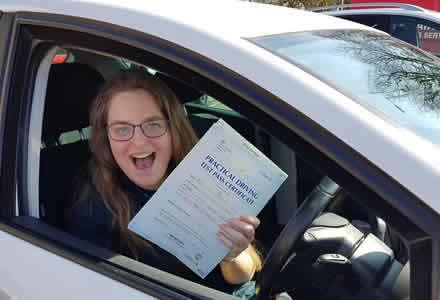 Note, however, that we don't just teach test routes - we cover ALL areas that are required to become a competent driver and this will include whatever areas an individual needs extra practice with to become competent and to drive to an above test standard. Spend all of your time driving and practicing the skills you need. We won't be sat on the side of the road unnecessarily talking about it. 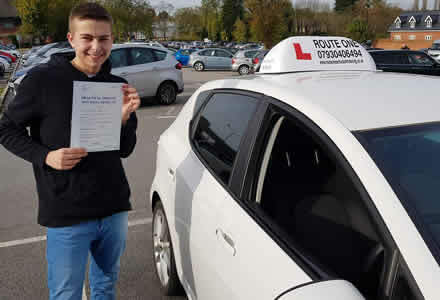 Flexible pick up and drop off points (within reason) within the Thetford and Bury St Edmunds areas - this can be useful if students want to be picked up from college within Bury St Edmunds and to be dropped off at home in Thetford, Brandon, Mildenhall etc. Our early morning start means that students sometimes opt to drive themselves to college as part of their lesson. 1-to-1 tuition with NO car sharing. It is a joint decision when you take your test. 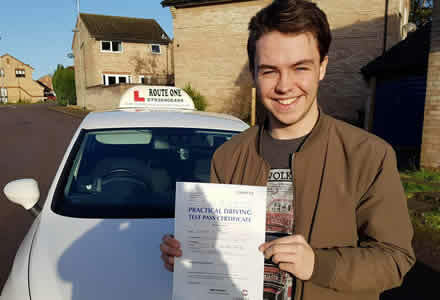 We will give you our honest opinion - rest assured that you will not be pressurised into taking more driving lessons than you need. Your lessons will be taken in a modern dual-controlled vehicle. This car is available to you to use in your test. We offer both manual and automatic vehicles. If you so wish, we can also carry out own car tuition once we mutually agree the standard of driving is safe enough. We subscribe to Theory Test Pro so that you can learn theory at your own pace without having to buy books. Theory Test Pro offers clear, easy-to-understand explanations and allows you to test yourself on your knowledge. They claim that their learners are "twice as likely to pass than the national average". Theory training is done on the move so that you do not waste valuable lesson time sitting by the roadside. Theory is generally a Q&A practice that starts from the first lesson. 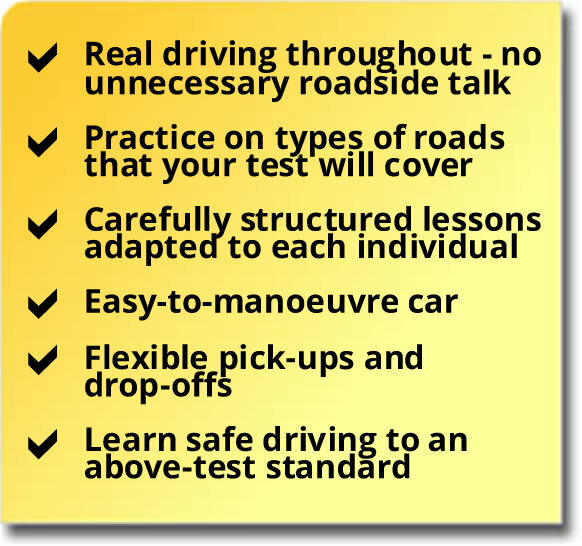 We cover the Show Me / Tell Me questions that you will face in your driving test. Discounts are given for 10 hours and 20 hours of prepaid lessons. Discounts for recommending friends: 1 hour free lesson as soon as your introduced friend starts taking lessons. The more you recommend us, the cheaper your lessons become! All fuel and insurance are included in the lesson fee. Note that we do not charge VAT. Semi-intensive courses can be offered at a frequency / duration to suit the individual's attention span, thus ensuring that you get the most from each lesson whilst still progressing quickly. We drive towards London for a minimum of three hours; longer training is available if required. The cars are dual-controlled. Normal routes include the A11, M11, M25 and A12 but these could vary if there are road works, traffic jams etc. Pass Plus is a driving course primarily aimed at new drivers (although any one can take it). Designed by the DVSA (Driver and Vehicle Standards Agency), insurers and the driving instruction industry, it aims to reduce the number of road accidents by teaching how to anticipate, plan for and deal with all kinds of hazards. The six modules cover driving on town roads, country roads, motorways, dual carriageways, at night and in different weather conditions. Our instructors are licensed by the DVSA to offer Pass Plus lessons. Some local authority areas - such as Bury St Edmunds and Thetford - require drivers to take a DVSA taxi test. 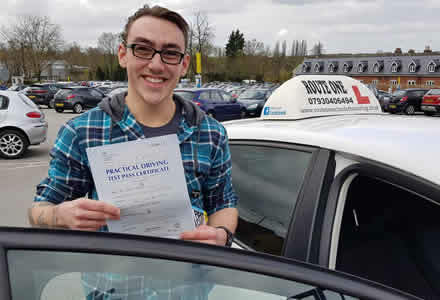 The test standard is set at a level suitable for full driving licence holders, which is higher than the learner driver test. To pass the taxi driving test, you need to complete it with no more than nine driving faults. We cover preparation for your taxi assessment test. We offer B+E trailer training. 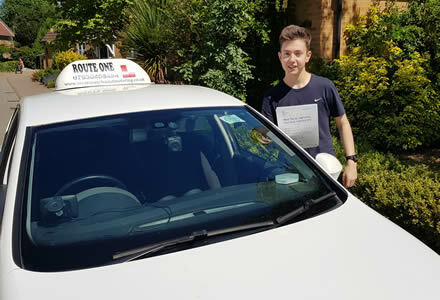 High quality, individually tailored driving lessons in the Thetford, Bury St Edmunds, Brandon, Mildenhall, Lakenheath, Ixworth and Stanton areas. 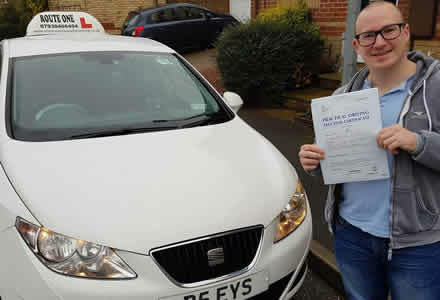 Experienced in teaching beginners and refreshers, nervous and confident drivers, and students with Dyslexia and Dyspraxia. Qualified to teach Pass Plus and Taxi Test Preparation. A range of flexible lesson plans are offered including semi-intensive courses.